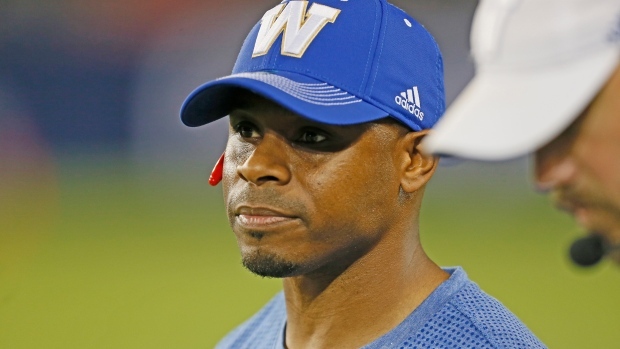 WINNIPEG — Running backs coach Avon Cobourne quit the Winnipeg Blue Bombers, the team announced on Saturday. Cobourne is pursuing interests outside of football and the team says a search for his replacement has already begun. The Blue Bombers will finalize its entire coaching staff in the next few weeks. Cobourne was a running back for the Montreal Alouettes between 2006-10 and then with the Hamilton Tiger-Cats in 2011 and 2012. He was an all-star in 2008, 2009 and 2012 and was named Grey Cup most valuable player in 2009. He was running backs coach for the Saskatchewan Roughriders in 2014 and 2015 before joining Winnipeg's staff in 2016.